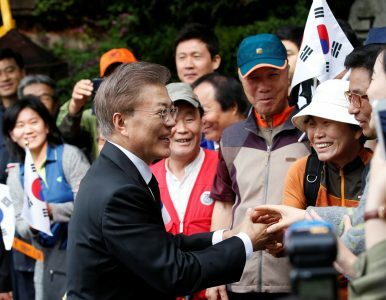 South Korea's President Moon Jae-in greets his supporters and neighbors as he leaves his house in Seoul, South Korea (May 10, 2017). With 41.1 percent of the vote, Moon Jae-in won South Korea’s 19th presidential election by a considerable margin. The second place candidate, conservative Hong Joon-pyo, took 24 percent of the vote. In fact, the 17.1 percentage point difference constitutes the largest margin of victory in the history of South Korean elections. As the leading presidential candidate from the opposition, this was Moon’s election to lose from the moment the snap election was called following former President Park Geun-hye’s removal from office in early March. He didn’t lose it. Aside from Moon’s definitive victory showing how committed South Koreans were to putting liberals back into power, there were several noteworthy lesson learned over the course of the 60 day-long period between Park’s removal and Moon’s ascension to the presidency. There is a clear generational divide in South Korean politics and society. This is the first lesson. Exit polls for the election show a substantial divide between those ages 20-40 — those coming of age under a democratic political order — and everyone older. More than 50 percent of those in their 30s and 40s and 47.6 percent from the 20s age cohort voted for Moon. Among the two oldest groups (60s and 70+) no more than 24.5 percent chose the liberal candidate. Interestingly, 13.2 percent from the youngest group chose moderate conservative Yoo Seung-min, the highest of any group. Not an insignificant number of voters from every age cohort voted for the center-left candidate Ahn Cheol-soo, but as an alternative to mainstream left or right, Ahn was stuck between a rock and a hard place; his poor electoral performance suggests as much. The age divide is significant given the conditions of the special election and the content of Hong Joon-pyo’s campaign. Younger South Koreans opted overwhelmingly for change, whereas older Koreans showed a somewhat surprising level of support for the conservative candidate, despite the conservative party’s identity crisis and fragmentation precipitated by Park Geun-hye’s impeachment. Hong ran on a simple message – vote for him or put the security of the Republic at risk. It was a message straight from the conservative playbook of the 1980s. One of his campaign banners flying at intersections in Seoul and across the country read, “Pro-North Leftists, No; A Free Republic of Korea, Yes.” Throughout the campaigning, Hong lambasted current President Moon Jae-in as such (a pro-North leftist). Hong, in other words, ran on an unabashed anti-Communist platform. Despite this seemingly antiquated message, a significant number of older Koreans voted for him. A certain amount of this is due to party identification and regionalism (see below), but those who voted for Hong can be understood as having supported his message. That 90 percent of those 60 years-old and older think anti-Communist ideology is important (a variable which, in addition to age, can be used to predict party support) shows just how sharp the social divide really is. This generational divide reflects differing national identities between younger and older South Koreans. A second, and related, lesson is that security concerns were not a vulnerability for Moon. As an establishment liberal, “security” was seen as Moon’s soft underbelly, and something which his competition (besides Hong) sought to leverage against him. Ahn in particular sought to differentiate himself vis-à-vis Moon by emphasizing a “tough on security” message. He didn’t use the antagonistic language Hong employed, but he did not shy away from calling North Korea the “main enemy” in a presidential debate (Moon was the only candidate not to do so) and signaled a willingness to get tough on North Korea. Despite attempts to undermine trust in Moon’s security bona fides, the liberal front-runner never lost a significant amount of support, according to polling data. This suggests the approach never took. Part of this has to do with the fact that voters were more concerned with labor market and economic issues than they were security concerns. A Gallup Korea poll that ran from April 30 to May 1 found that economic revival was the most important issue (17.3 percent of all respondents said this), followed by job creation (14.3 percent; 23.5 percent for those aged 19-29). Security wasn’t unimportant (14.3 percent overall), but specific issues received scant interest (the U.S. Terminal High Altitude Area Defense (THAAD) missile defense system, for instance, registered a mere 3 percent of responses). In fact, according to Gallup Korea, most people thought Moon Jae-in was the candidate best suited to confront all of the problems salient in this election – including security-related ones. On problems of trust, bringing needed change and reforms, addressing economic problems and social welfare, North-South relations, and handling national crises, Moon was the candidate selected as being the best suited. People also expressed feeling closest to Moon’s positions. Notably, in 2012, when Moon ran and lost against Park Geun-hye, the only positions on which he scored better than Park were social welfare and change and reforms – issues that liberal and opposition candidates would be expected to fair better on. If anything, Moon co-opted any concerns about his position on national security and North Korea by emphasizing a strong message on national defense. While he signaled his intent to pursue a more autonomous role for South Korea on peninsular affairs, the denuclearization of North Korea and national security of South Korea were emphasized as top priorities. Moon pledged to resume commercial ties with North Korea (namely, re-opening the Kaesong Industrial Complex), but repeatedly stated he would work closely with the United States on addressing the security threat posed by North Korea’s nuclear program, rather than go at it alone. THAAD was (and remains) somewhat of a question mark, but no indication was given that Moon wishes to fundamentally redefine the ROK-U.S. alliance, or pursue a radically new foreign policy. A third lesson learned this election is that regionalism is still a powerful political force in South Korea. While this may strike some readers as obvious, it’s notable given the special circumstances of the election. The country’s southwestern and southeastern provinces are liberal and conservative strongholds, respectively. The southeast received the lion’s share of resources and investment for development during Park Chung-hee’s dictatorial but developmental reign (1962-1979). The political implications of this uneven development are easily seen. Voters from the southeastern provinces – North and South Gyeongsang, plus the metropolitan city of Daegu – vote overwhelmingly for conservative party candidates, whereas voters from the region of Honam – the southwestern provinces of Seoul and North Jeolla, plus the city of Gwangju – vote for liberal party candidates. This has held true in every election in modern Korean history, until this one. One informed observer of the election outcome noted with enthusiasm that Moon is the first president to take both the southwestern city of Gwangju and the southeastern port city of Busan (he also took Ulsan, just north of Busan). This is true, but Moon’s electoral victories in the region are explained in large part by the fact that he is from there. Born on Geoje Island in South Gyeongsang province, Moon’s family eventually moved to Busan, where Moon was raised. If one looks closely at the voting numbers, the regionalism which has defined elections in modern South Korea is still present. In North Jeolla, South Jeolla, and the metropolitan city of Gwangju, Hong Joon-pyo earned equal to or less than 3 percent of all votes. In North Gyeongsang, Hong won with 48.6 percent to Moon’s 21.7; in Daegu (another metropolitan city region) Hong took 45.4 percent; and in South Gyeongsang – technically Moon’s “home province” – Hong also won, although he took the province by less than 1 percentage point. These southeastern provinces and the city of Daegu are the only administrative districts that Hong won. At 77.2 percent, voter turnout was indeed higher than it was in 2012 by more than 1 percentage point. It was, however, significantly lower than projected (91 percent) and notably lower than the average for presidential elections in the first decade and a half of the elections in the democratic era. There is a fourth lesson lurking within the data. Between 1987-1997, the average turnout was 83.3 percent. Between the election of Roh Tae-woo in 1987 and Lee Myung-bak in 2007, voter turnout steadily decreased. It has rebounded noticeably since 2007 (more than 10 percentage points), but turnout has yet to return to its earlier average of 80 percent-plus. While turnout for this election may have been higher than it was in 2012, given the circumstances of this election (and the record-breaking projection), far fewer people cast ballots than otherwise thought. It’s too early to conclude definitely, but the decrease in turnout over time is likely due to an increase in political apathy among younger voters. Pooled longitudinal data from the World Values Survey (WVS) show that those who came of age in the democratic era have significantly less interest in politics than those who came of age prior to the democratic transition in 1987. Interest in politics has a moderately high correlation with whether one votes, indicating that younger people are voting less because they care less about politics. It’s not yet clear if this is definitely true, but it wouldn’t be surprising if it is. Younger populations in older democracies have been found to express less interest politics as well. Despite the generational and regional divides, the nation as a whole is rather bullish on Moon. According to a post-election poll by the Korean Society Opinion Institute (KSOI), 83.8 percent of 1,000 randomly surveyed respondents expect Moon Jae-in to do a good job handling state affairs. Of course, it is too early to know whether he will actually do well, and given the way the Park Geun-hye administration came to an end the only way to go is up. It is, nevertheless, notable that the populace is bullish on Moon Jae-in. Barring another presidency-ending scandal, he’s got five-years to prove it. Steven Denney is a political scientist at the University of Toronto. While the economy dominates the election, South Korea’s next president will have important foreign policy choices to make.